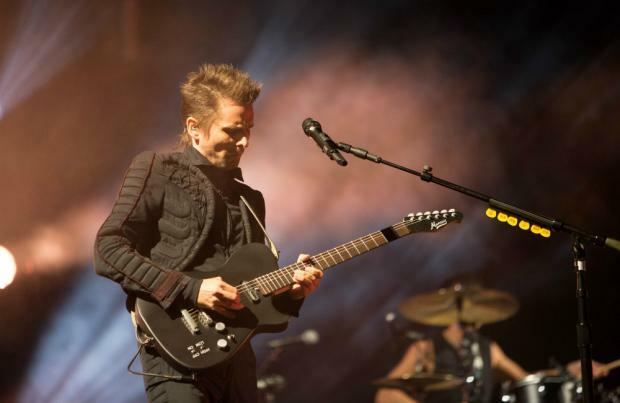 Matt Bellamy has teased the epic guitar solo on Muse's album track 'The Dark Side'. Matt captioned the Instagram clip of him slaying the instrument: "The Dark Side guitar solo. Make your own accompaniment! #musethedarkside #guitarsolo #inthegarage (sic)"
The song teaser comes after the British trio released futuristic 'Something Human' from the record, due out in November. They also accompanied the cinematic track with an impressive action-packed music video, which sees the frontman speed around in a fast car being chased by drummer Dominic Howard and bass guitarist Chris Wolstenholme, and is based on the Tyler Posey-starring supernatural drama series 'Teen Wolf'. In the promo, the car's registration teases 'The Dark Side'. 'Something Human' - which was co-produced by the 'Plug in Baby' hitmakers themselves, Rich Costey and mixed by Mark 'Spike' Stent - addresses the need to reset and re-engage with our human emotions. Matt said previously: "Life on the road can bring out your inner beast, this song and video is about taming that beast, desiring a return to something human. Plus, 'Teen Wolf' is cool." So far Muse have released 'Dig Down', 'Thought Contagion' and 'Something Human' from the new record. Matt revealed last month that their long-awaited follow-up to 2015's 'Drones' features 11 original tracks and some bonus numbers, and that the next single will be a song called 'Pressure'. He said: : "We've got three out now, Dig Down, Thought Contagion and Something Human, then we've got another song Pressure, which will come out just before the album. "That's a more straight Muse rock track, like a different riff every ten seconds, basically. The album's coming out in November, we've got eleven tunes on there. "Plus, there's gonna be about seven or eight extra tunes, like acoustic versions, stuff like that. We're just in the process of finishing that off right now. We're pretty excited about it."